This entry was posted in Python, Runaway Ads, Twitter. Bookmark the permalink. I definitely agree that this would be a great way to share our findings and get people interested in our project specifically, and maybe in the history of slavery more generally as well. I wonder how people might react to seeing the ads in their Twitter feeds though? Since people often go to Twitter to relax and read funny tweets, it may be off-putting to encounter such a sobering subject in the middle. On the other hand, this might be exactly the point! 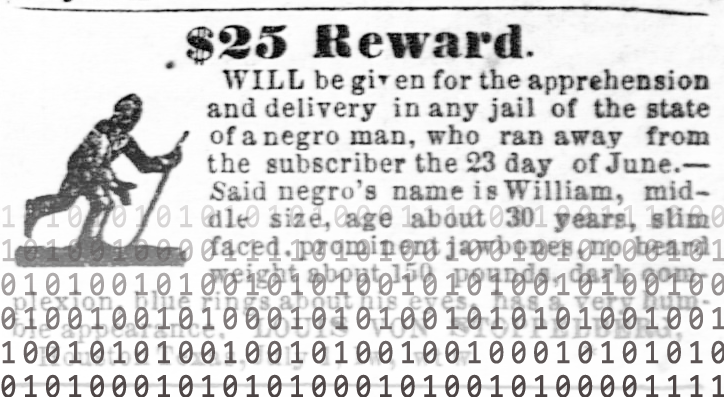 In class we talked about how posting the ads on Twitter could be a good way to convey the prevalence and the everyday nature of the ads in 19th C newspapers. When looking for ads in the Telegraph, I noticed that the newspapers often contain lighthearted poems, humorous stories, or notices of local events. To us as 21st C readers, one of the disturbing aspects about these ads is how they are mixed into the rest of the newspaper in such a mundane way. If the ads were mixed into a Twitter feed, among all the jokes and day-to-day updates, it would have a similar kind of jarring effect. Excellent points, Alyssa. I think that an essential part of any tweetbot would be a link back to a post, perhaps on this site or on our final one, explaining our reasoning for doing it. It may help to know that we wouldn’t be wading into totally uncharted waters here. There are other Twitter feeds, like @JQAdams_MHS, @CWDaybyDay, and @MotherWhitman, that tweet excerpts from primary sources. And many DH projects have Twitter feeds directing people to their content; see, for example, @VizEmancipation. I’ve gone ahead and started mocking up code for a Twitter bot. The part that actually posts the tweet has already been tested, but we’ll have to do some more work to actually get the transcriptions, shorten them suitably, and post to Twitter.